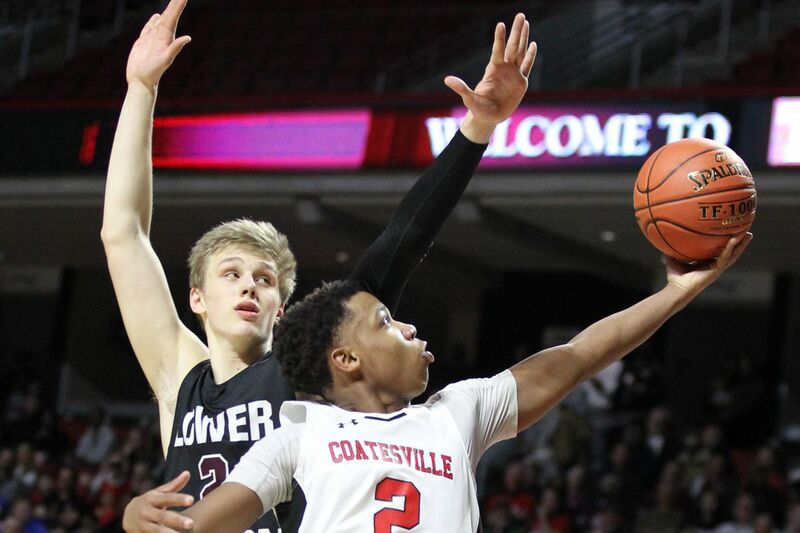 Jhamir Brickus, front, of Coatesville scores in front of Jack Forrest of Lower Merion in PIAA District 1 boys basketball semifinals at the Liacouras Center on Feb. 26, 2019. The Math, Civics and Sciences boys’ basketball team had lost to Constitution twice this season in Public League action, and was down by 19 points at one point in the PIAA Class 2A semifinals against Constitution on Monday. But the Mighty Elephants found another gear, and beat the Generals, 73-65, in overtime. Junior guard Jabarr Slaughter hit a game-tying three at the buzzer to send the game into overtime. MCS changed it ways defensively, which was key in getting them back into the game. Bishop McDevitt boys’ basketball is back on the map. The Lancers advanced to the PIAA Class 3A semifinals for the first time in recent memory, but that’s as far as they’d go, losing to Trinity, 63-56. Coach Will Chavis accomplished one of McDevitt’s goals this year, and that was getting to The Palestra for the Catholic League semifinals. They also got past Neumann-Goretti in the quarterfinal round of states. Shamir Mosely led the Lancers with 16 points, while Jamil Manigo added 10 points. Those two guys, along with other contributors, was a key reason Chavis turned the program around in two years. Jhamir Brickus follwed up his 52-point game last Saturday with a 20-point outing in a 75-69 loss to Kennedy Catholic in the PIAA Class 6A semifinals. The junior guard averaged 36.0 ppg in four state playoff games. Dapree Bryant had a team-high 26 points for the Red Raiders. Jenkintown had a nine-point lead at halftime. But the Drakes went cold in the second half, scoring only nine points, and fell to Lourdes Regional, 32-25, in the PIAA Class A semifinals. This was the third straight year Jenkintown appeared in the state semifinals. They won it all last season. Jenkintown will only be losing two seniors, twin sisters Mia and Natalie Kolb. Mia has etched her name as a 1,000 point scorer in the Drakes’ program. Carly Mulvaney had a team-high nine points. Natalie had eight points, while Mia finished with one point. “They definitely led by example this year, and ever since they came into the system [as freshmen],” Romano said. They’re hard-working kids, and everything you want in a student-athlete. Our younger girls have definitely taken advantage of their work ethic. “There’s definitely a bright future for us,” he added.